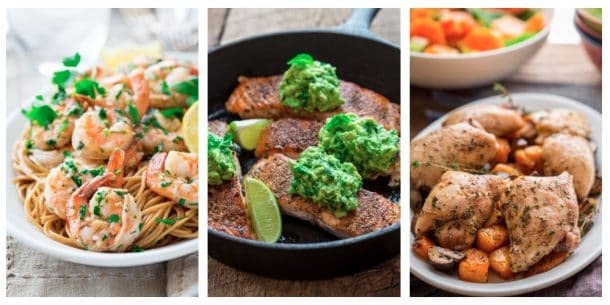 Are you new to Meal Prep? Today is the day to give it a go! 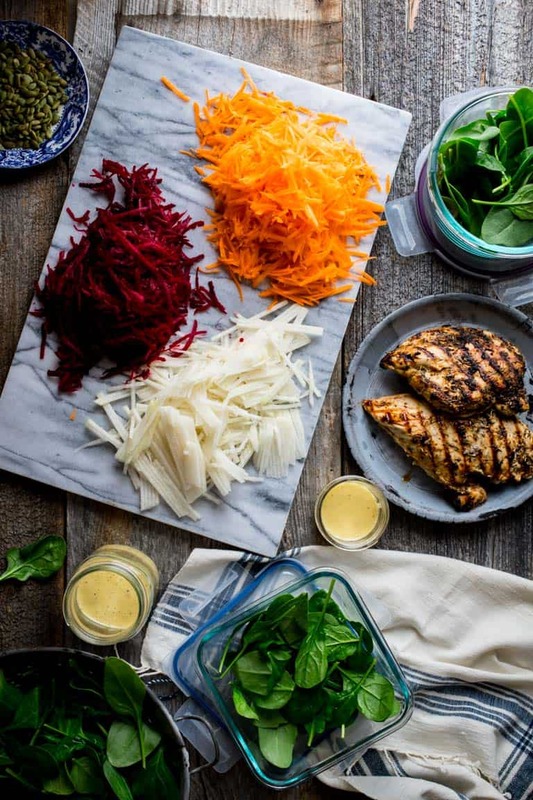 You can start your new year off right and pack these high-protein Spinach, Beet and Chicken Power Salads for a week’s worth of healthy hunger-busting lunches. Well hello 2018! So glad to meet you. I’ve said before why I don’t believe in New Year’s Resolutions, so we’re not going to be talking about that. Phew. But we are going to talk a bit about being healthy this year and setting some GOALS. To me goal setting is more of a positive than a negative way of looking at making positive changes. 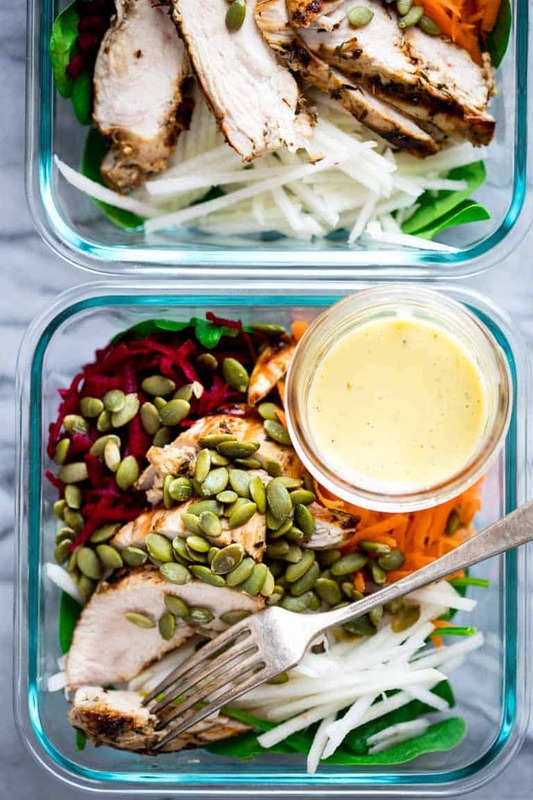 In addition to adding these high-protein meal prep salads to your list of #GOALS, I want to quickly add one more goal to your list. Then we can get into the deets about how to throw these superfood packed power salads together. K? If you are over 40 and a woman, add This Unmillennial Life to your list of podcasts. Pop over there and subscribe right this minute, and you can thank me later. How’s that for an attainable goal? All you have to do is click a button. Boom! One of my favorite episodes was the Protein (Bar) Episode where Regan interviewed Jessica Crandall, RD, CDE about how much protein women over 40 should be getting and why it is so important. And guess what. We need A LOTTTTT of protein!!! Like OMG I am so glad I listened to this because it really was a wake up call to pay more attention to the balance of macronutrients in my day. I am not at all getting enough. In her interview Regan also talked to Chris Mohr, RD, PhD who explained that we need to eat protein throughout the day because we don’t store it like we do fat and carbs. He says try for 20-30 grams per meal! Guys, I am no where near that. How about you? Jessica recommends if you’re using protein bars for meals on the go to aim for every 100 cal choose a bar with 10 grams protein. 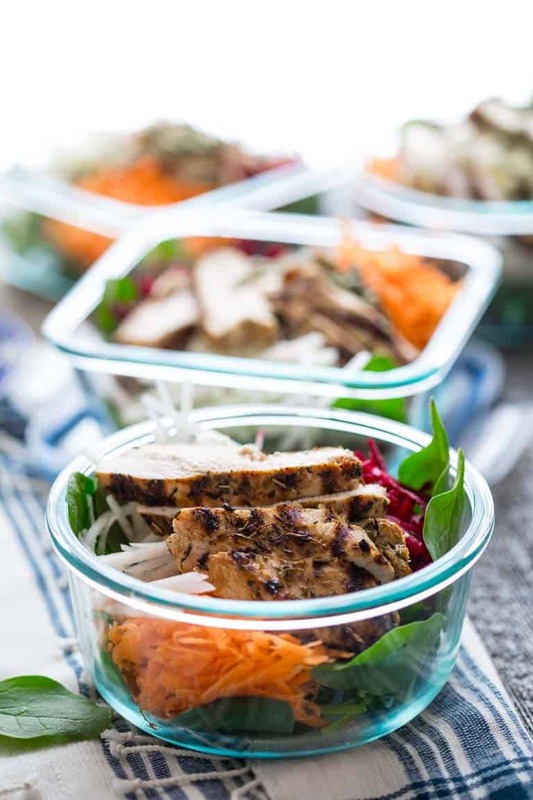 Anyway, these meal prep Spinach, Beet and Chicken Power Salads are loaded with protein- 30 grams! Holla! 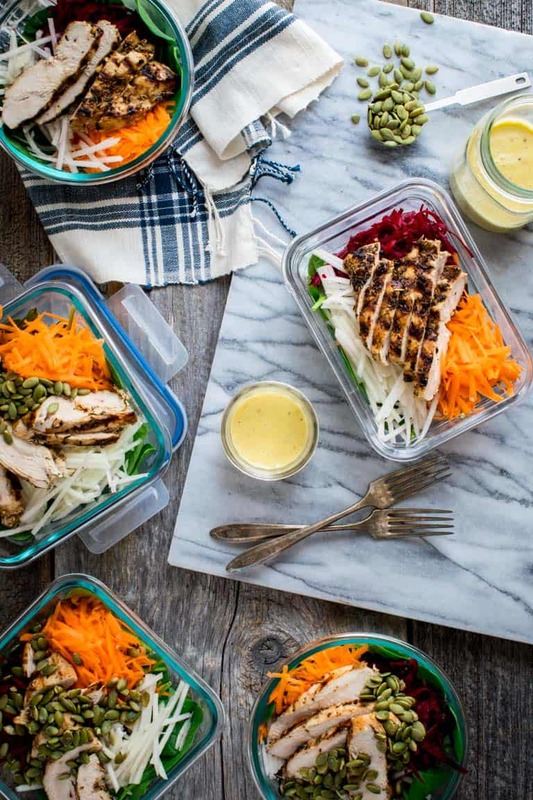 Let’s talk about how to meal prep, shall we? Marinate your chicken first. This recipe for Garlic Herb Marinated Chicken is a must-try if you are new here. Seriously folks, it is one of my personal favorite recipes on the blog, not just because it tastes fantastic, but because it is so easy to make. Plus it only takes 30 minutes to marinate! 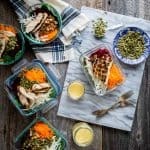 For these meal prep salads, one batch yields enough chicken to provide the above mentioned reccomended 30 grams of protein per serving. I used my indoor grill pan to grill the chicken, because it is cold and snowing here in Vermont. It takes 13-15 minutes on the grill pan. Make sure you let the chicken rest before you slice it. It is also even better if you let it cool too before you top the salads with it, so it doesn’t wilt the veggies. While the chicken was in the marinade, I blended up the dressing. I used this Apple Cider Vinegar Salad Dressing, because it is so delicious and healthy. But if you want to try something more adventurous, I have a huge selection of healthy home-made salad dressings to choose from. 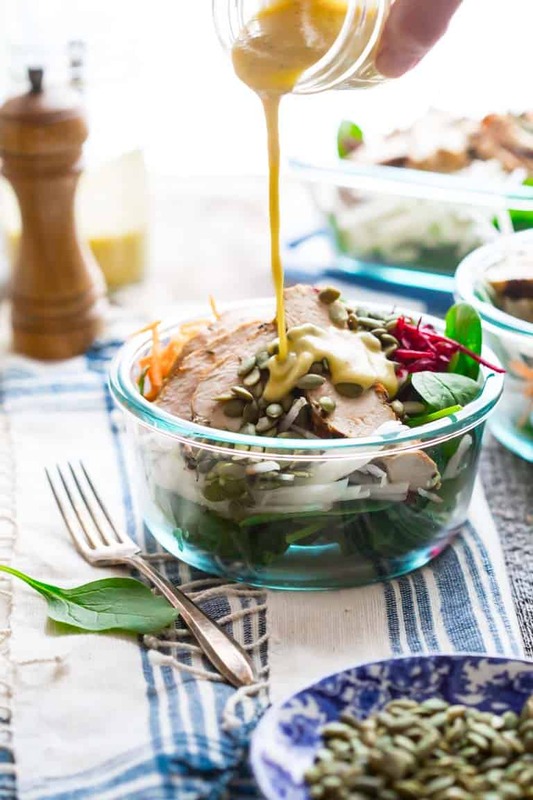 This Maple Tahini Dressing or This Walnut Balsamic Vinaigrette would also be super yummy with the ingredients in these Meal Prep Salads ingredients. You’ll need 10 tablespoons of dressing. While the chicken is grilling, shred your veggies up. I used Beets, Carrots and Kohlrabi, because they are great winter storing vegetables, and among the locally grown vegetables that I can find in January in Vermont. In my reader survey, a lot of you told me that buying locally is also important to you, so I know you’ll appreciate that! I used the box grater for the carrots and beets, but I used my Oxo mandoline for the kohlrabi. If you don’t have a mandoline, a box grater would work fine for the kohlrabi too. Next assemble the meal prep salads and top with your seeds or nuts. Pack the dressing separately so they will last for 5 days in the fridge. I like the little tiny ball jars for this, but any little spill-proof resealable container works well. Have you ever done meal prep? Have you listened to This Unmillennial Life podcast? Did you know that women over 40 need that much protein throughout the day? Do you think you’re getting enough protein? Thanks so much for reading, and if you haven’t already make sure to sign up for my email newsletter. I send it out every Saturday morning, so you’ll never miss anther healthy recipe. 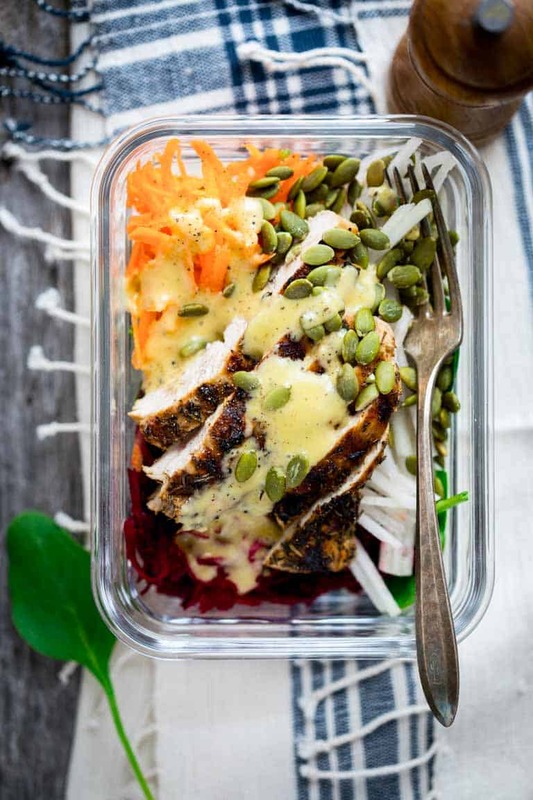 A High-protein meal prep lunch idea: Spinach, Beet and Chicken Power Salads. Prep on Sunday and bring lunch to work all week long. 30 grams of protein, 10 grams of net carbs and naturally gluten-free, paleo and whole30 compliant. Set 5 re-sealable containers on work surface. Divide spinach among the containers. Top with beet, carrot and kohlrabi. Add chicken and nuts or seeds. Seal container. 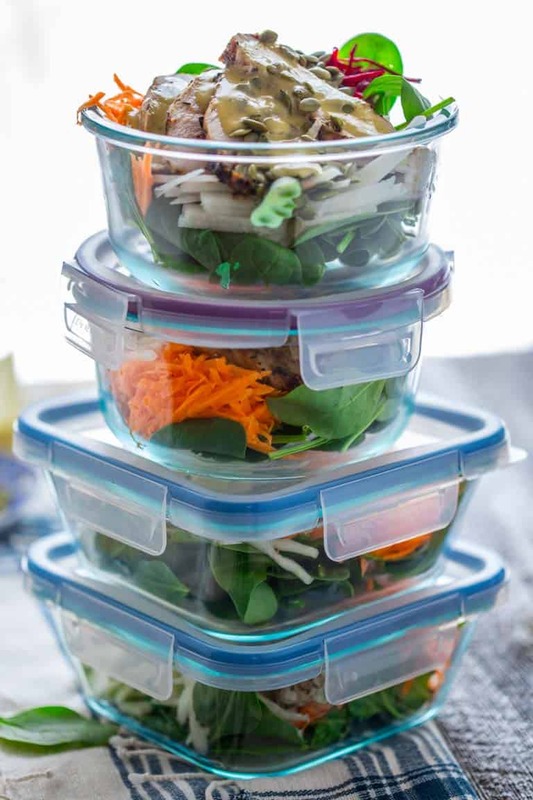 Divide salad dressing among 5 small jars or re-sealable storage containers. Refrigerate up to 5 days. Serve the salad with the dressing. This looks so delicious, love the sound of the dressing! Thanks so much Emily. That dressing is one of my favorite stand-bys! I’m loving the carrots and pepitas mixed into this meal prep. What a great bunch of textures. I am so glad you mentioned that Ginny because that was a big plus for me too. Have a great day and thanks for coming by. Oh this looks like a perfect addition to my work lunch routine! And can I just say that I LOVE that you used kohlrabi? It’s one of my favorite veggies, and I almost never see it included in recipes. 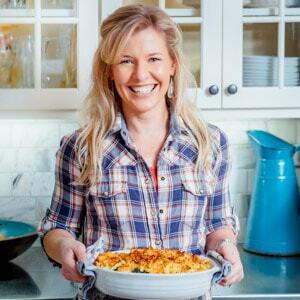 I am so with you Jen, I think more folks should get on board with Kohlrabi. Glad you appreciate that fact. Happy Cooking! Awesome! Please let me know how you like them. I appreciate the feedback. Have a great weekend. This looks so delicious and heart healthy. Love the selection of veggies and the dressing. I rarely eat beet but would love to add more to my diet. I love beets too, but am more likely to use them in the summer (we love them pickled.) I am glad you appreciate that I included them. Have a great day Veena. Hi Katie.. I have never had raw beets.. this is ok to do? I was thinking of using the pickled beets instead,,, I love those.. but if I can use raw, what is the general flavor of them? LOVE this salad.. the more protein the better!!! Yes you can eat the beets raw. I love pickled beets too, but I think they may wilt the salads wile they sit in the fridge for the week. In general the flavor of the raw beet is less pronounced. Not as sweet, still mildly earthy. Glad you’re on the protein train. It is so important! I am curious if the beets are cooked or raw? I wasn’t sure if raw beets would be ok to eat, or taste very good raw. I’m so gonna listen to that “Unmillennial Life podcast” Thanks so much for this post – I had no idea I’d need that much protein! And WOW – I adore beets so THIS salad is calling my name! Hey Kristina! I am glad you’re digging these salads. We love a big salad at lunch around here.